If you've been reading along with my past "Monday's Menu" blog posts then you know well that I love my roasted veggies. I can't help it. It makes every vegetable taste better in my opinion. So, I tend to add it as every chance I get. Today's quick post is to share another Paleo and Whole 30 friendly dinner idea that is quick to prepare aside from the vegetable's roasting time. I made this dish a long while back, but pulling it from the archives to share to mix in a fish option from my usual (chicken). The Menu (all Paleo and Whole 30 Friendly): baked fish with kale, a spiralized cucumber and kale salad, with roasted eggplant and red bell peppers (because this is what I had on hand). I prepared this meal for two so if you're serving more then you'll need to multiply the list below but also note that one full vegetable cut and prepared may provide multiple servings for this meal. Shopping List: white fish of your choice, kale, 1 cucumber, cherry or grape tomatoes, 1 small eggplant, 1 red bell pepper, 1 small avocado (optional), capers, coconut oil or olive oil, 2 fresh lemons, salt, pepper, and fresh or ground dill (optional). Roasted Eggplant and Red Bell Pepper: You'll want to start this first as it takes the longest to roast. I used small purple and white eggplant that was from my parent's garden. Wash the eggplant and red bell pepper, then cut off the ends/stems if any. You'll want to remove the seeds of the bell pepper. Note* you can use any color of bell pepper you want, I just happened to have red. I sliced these vegetables approximately the length of a french fry - for reference. You can toss them in 1/2 to 1 tbsp of olive oil or coconut oil if you'd like before roasting. I roasted them without oil. Roast these for 30-45 minutes at 350 F on a greased, foil lined baking sheet, depending on your preferred level of crisp edges and of course your oven's strength! After it's done roasting you can sprinkle with your favorite seasonings. My go-to's are usually pink Himalayan salt, turmeric, paprika, garlic powder, etc. There's no right or wrong here. Baked Fish and Kale: I tried a new thing here when I made this compared to what I used to do. I simply added kale underneath the fish to test how it would turn out and hoped for the best. I'd say it was ok, but I've had better kale sides. However, with additional spices over the kale itself (under the fish) there might be more pizzazz. My usual go-to when I bake fish is to wrap it in foil. This traps in the heat and moisture as it cooks which ultimately keeps the fish from drying out. Genius! Cut foil squares large enough to wrap around and seal your fish fillets while also leaving a little space between the top of the fish and the foil. I rubbed olive oil on both sides of the fish, and then added a little bit of coconut oil (while stick thick, not melted) on top of the fish. Next, cut and squeeze your lemons generously on top of the fish. If you have dill, you can sprinkle dill on top of the fish as well. That is how I prefer it, but I was out of it when I made this meal. Last, you will add capers (optional) to the top of the fish. You can do this before you bake it, or after. Close and seal the foil packets carefully so that you don't knock off the things you places on top of the fish, and transfer to a baking sheet to bake at 350 F for 15-20 minutes. Make sure to cut into the fish before serving to make sure it is cooked through. I added sliced avocado right before serving because I needed to use it up, but it was a nice touch and let's be honest...who doesn't like avocado??? Spiralized Cucumber and Kale Salad: Wash the kale, cucumber, and cherry tomatoes thoroughly. Cut off the ends of the cucumber to create a flat surface on both ends and place it into the Spiralizer. 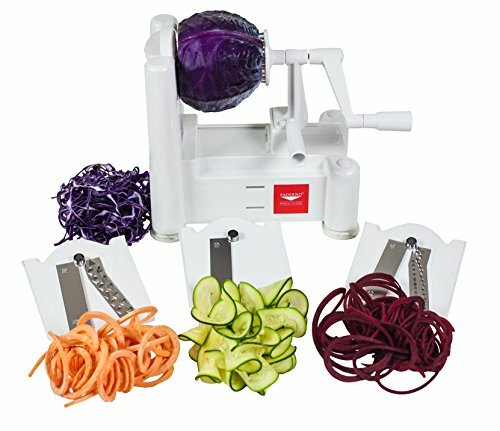 Using blade C (if you have a 3 blade Spiralizer), begin to work the magic to produce cucumber noodles. MAGIC. EVERY. TIME. Next chop up the kale leaves to your size preference. Slicing the tomatoes into halves is optional, but I think it looks prettier. I mixed these together in a bowl with Italian dressing I made using olive oil, white vinegar, and Italian seasonings. Sometimes I replace the white vinegar for balsamic vinegar which is my favorite option. Also, I wouldn't normally use so much kale in one meal, however my parent's garden was in abundance at this time so they generously gave me a ton of it to use. When the vegetables and fish are done baking you have yourself an tasty meal that's very healthy and pretty easy to clean up because you can toss all of the foil into the trash. Voila. I hope you enjoy this dinner/lunch idea and share with someone who might need a new idea of something to prepare.